From ski resorts to financing efficiency projects, there are great dividends all across the market. Not all dividend stocks are household names, even for investors. Many companies chug along year after year, paying stable dividends from businesses with durable competitive advantages. We asked three of our investors to name great, but relatively unknown, dividend stocks; Vail Resorts (NYSE:MTN), Costco Wholesale Corporation (NASDAQ:COST), and Hannon Armstrong Sustainable Infrastructure Capital (NYSE:HASI) made the top of the list. Jeremy Bowman (Vail Resorts): When investors think of dividend stocks, defensive sectors like telecoms, consumer staples, and healthcare usually come to mind. But if you're looking for an outstanding dividend play, you may want to consider the nation's largest ski-resort operator. Shares of Vail Resorts have been tearing it up lately, climbing about 300% over the past five years. Vail's dividend yield of 1.8% may not bowl over income investors, but the growth in its quarterly payout is hard to match. 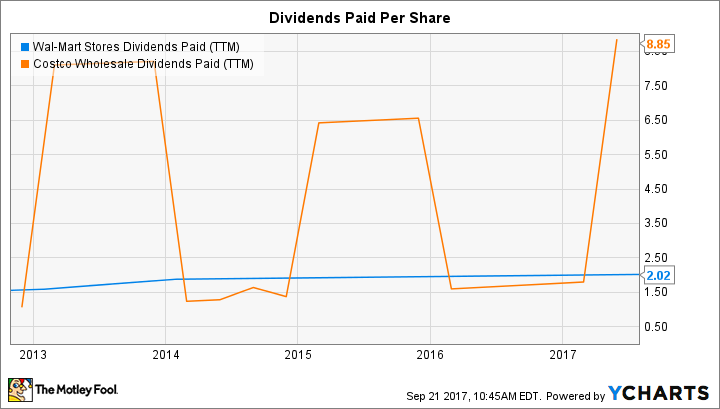 Since 2013, its quarterly dividend has jumped more than five times, from $0.207 to $1.053. In other words, if you had purchased Vail shares five years ago, today you'd have an effective yield of close to 8%, based on your purchase price. Its dividend growth rate has gradually slowed down each year since 2014, but the company should be able to hike that by around 20% on an annual basis, as earnings per share are forecast to grow by that much this year and next. The company's aggressive acquisition strategy has paved the way for future growth as well: In the past year it's acquired Whistler Blackcomb, North America's biggest ski resort, and also made its first foray into the Northeast with its purchase of Stowe Mountain Resort in Vermont. Vail has leveraged such acquisitions by including them its all-encompassing Epic Pass and by investing to build off-season business. With a promising growth path ahead of it and a commitment to dividend hikes, Vail is one under-the-radar dividend stock you won't want to miss. Demitri Kalogeropoulos (Costco): Costco's 1.2% dividend yield likely keeps it off the radar of many income investors. After all, you could double that rate by owning rival Wal-Mart (NYSE:WMT). The retailing titan also pays out 50% of earnings in dividends, compared to the 31% implied by Costco's quarterly commitment. In practice, though, the warehouse giant is much more generous than Wal-Mart -- or almost any other major retailer. It's just that Costco's favorite method for returning cash to shareholders lately has been through special dividends. It delivered $8.4 billion through this channel over the past five years, through two $7-per-share paydays in 2017 and 2012, and one $5-per-share sum in 2015. These add up to about 70% of the profits that the company generated over that time. WMT Dividends Paid (TTM) data by YCharts. Special dividends are far less reliable than a simple quarterly commitment. Income investors could accept that major drawback, though, at least while Costco continues directing cash toward aggressively expanding its store base. Once that's done, I'd expect the retailer to move toward more regular increases instead of those generous, but unpredictable, annual spikes. Travis Hoium (Hannon Armstrong Sustainable Infrastructure Capital): When companies need to fund energy assets, whether they're efficiency, wind, solar, or other infrastructure assets, they turn to Hannon Armstrong Sustainable Infrastructure Capital. The company finances these assets through a variety of structures like secured debt, preferred equity, or purchasing a project outright. Sometimes projects are financed for as little as a few years, while other investments, like wind and solar projects, can last for decades. What makes Hannon Armstrong different from most yieldcos or energy companies is that it generally takes senior positions in assets. This means that it will own preferred equity instead of common equity, or that efficiency projects will be backed by a property lien; this is different from other yieldcos that take equity positions in projects and then take out debt. It reduces the risk that an asset won't perform as expected, and ensures cash flows for the business. And the fact that Hannon Armstrong can be flexible in how it finances projects has been an asset, because it can fund projects others would avoid altogether. The asset financing is ultimately what pays the company's current 5.5% dividend yield. And with billions being invested annually in renewable energy and efficiency projects, there will be plenty for the company to finance long-term.